Earlier this year, Google made headlines – when doesn’t it – announcing a major strategic pivot. After having helped define the mobile first age, Google was now going all in on artificial intelligence, shifting to an AI first world with numerous AI-centric product announcements. Naturally, markets, analysts and commentators took notice. Google is not alone in embracing AI. And Google-watchers aren’t alone in getting on the AI bandwagon. So it got us thinking, what is AI, really? With so many contested narratives about AI and its future, we thought we’d ask some of these questions to a bona fide AI expert. Respected thought leader on issues involving the intersections of technology and society, Kathryn Hume is Vice President, Product and Strategy at integrate.ai, a Toronto-based SaaS company, which helps large enterprises reinvent their customer experiences with AI. 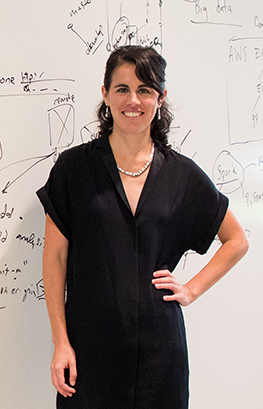 She brings a rare, humanistic and interdisciplinary perspective to her work on technology and data science. She recently joined early-stage venture firm, ff Venture Capital (ffVC,) as a venture partner, where she’ll use her experience helping companies integrate AI into their strategies to advise AI-curious startups on how to use the new technology. Before taking her current role at integrate.ai, Kathryn served as Director of Sales and Marketing at Fast Forward Labs, where she helped enterprise clients across industry apply AI to solve major business problems. She’s lectured and written extensively on AI, technology, culture, law and society. Kathryn received her PhD in comparative literature from Stanford University and a BA in mathematics from the University of Chicago. She also speaks seven languages. She agreed to sit down for a wide-ranging interview on AI, its ethical pitfalls, representations in culture and barriers to adoption in the enterprise. The interview has been condensed and edited for clarity, and we’ll be releasing it over the course of three blog installments. First off, what jumps out of your bio is your academic experience. Tell me about how you moved from studying language as a literary scholar to an interest in how computers process language. My interest in artificial intelligence actually started with an interest in natural language processing (NLP) when I was at Stanford doing my PhD. I was actually first introduced to modern, contemporary natural language processing techniques when I was doing an internship with a digital advertising company in my fifth year at Stanford, in the process of writing my dissertation. I started to dig in a little bit and learned that basically the focus of these tools was to be able to recommend the right ad to somebody who was reading an online journal, like The New York Times and Wall Street Journal, and have there be some sort of affiliation between what the person was reading, which presumably would indicate interest in that topic, and the right ad for that person. When I went in and tried to learn more about those underlying technologies, I quickly learned that they were using statistical techniques that didn’t process language like we do with syntax and semantics. Some didn’t even recognize words, but performed statistical analysis on characters. It was radically different from what makes languages interesting to humanists. I was just fascinated by that. It spurred my curiosity in trying to understand more deeply how it was that brute statistics could serve as proxies for semantics and meaning. That was actually my initial inspiration to pursue a career in artificial intelligence. And since that point, I’ve dived further into all of the interesting complexities of using statistics to create competencies that seem like they comprehend when in fact they’re really not under the hood. One more question about your background. You come from a field where the idea of learning has a certain valence, albeit contested, what does the machine learning community mean by learning? Well, learning is a term of art in machine learning that I think a lot of people outside of the field misunderstand. We assume learning is just like how we learn. And a lot of the most intrepid research efforts in artificial intelligence are indeed inspired by how both humans and animals learn; they have been inspired by observing animal behavior and then trying to develop formal mathematical models that can in some way encapsulate or mimic the processes that organic brains use when they are adapting their appreciation of some environment to either make decisions or to carry out tasks like perceiving things. But, in essence, and this is a gross effort at trying to simplify, I like to define what learning in the machine learning context means as the opposite of high school Algebra. When we learn Algebra as kids – and I think the other thing that’s relevant in my background is that I was a Math undergrad and then only later went into Literature – we are given a function, let’s say, y=mx+b. We’re given a bunch of x-values, and we’re supposed to plug them in and solve for y. Let’s say m is three, and x is two; you plug in the values in the equation, and then we get things out. What I like to say about machine learning is that we’re solving for m, as opposed to solving for y. Basically, we’re given a bunch of things, a bunch of y’s and x’s, and the task is to infer, based on all of the right answers that have been given to us, a function that does a really good job of describing that data. Then, we can use that function for future cases, when we put in our x-value, we can make a good estimate on what the y was. All the huge excitement around machine learning these days comes from the fact that we’re now able to model functions that aren’t just simple things, like mx+b, but are in ten or ten million dimensions. That ability to generalize into increasingly complex functional expressions enables us to do things that seem relatively complex, like image recognition tasks, or agents moving in a world, etc. So really, learning is just a fancy way of being able to identify a function that does a good job fitting a particular task. Interesting, so learning for machines doesn’t have really that much to do with some of our common ideas of learning, like perfectibility? Well, it’s interesting. We have to state the objective of the learning task to a machine learning system. Computers can’t go out and decide what it is worth learning. Let’s say it’s something like, I want to find the fastest route to get from point a to point b – this might be interesting for location services – and so we say to the computer, we need to get to point b. There’re a million ways to find the fastest one. But the machine needs to have direction; we call that the objective function. It needs to know what it’s working towards. It can’t figure out, interpret and do any strategic-type thinking to make a judgment call on what might be worth knowing. It can only find out the best way to know something, once you’ve provided it with a framework or some parameters. And this is a big question for Neuroscience and Cognitive Science. There are certain types of tasks that the brain carries out – I think in the visual cortex. They’ve shown that the architecture of our visual cortex is actually quite similar to new neural networks, which are these general, function-approximation tools. But our brains are complex. We’ve got billions and billions of neurons. We also have a lot of plasticity, where the weights between them and the way the connections lie between the neurons, can shift in ways that are still a level of complexity beyond what we’re able to generate in the realm of bits and code. So a machine’s learning is both like and unlike learning; and there are a lot of differences than we can point out between what makes an intelligent human being and what makes an intelligent machine. And yet, the promise is that with enough complexity, enough speed, enough sort of plasticity and hardware, and as people make new advances, we might be able to get closer to mimicking the complexity of our brains, in which case we might be able to have machines learn a little bit more like we do.